4. Install the permanent opening (P.O.) plug drain, as shown in view A, figure 5-19, or the pop-up type of drain, as shown in view B, figure 5-19. 5. Connect the water-supply lines, as shown in figure 5-20, to the faucets. Figure 5-19. - Lavatory drains. Figure 5-20. - Lavatory water-supply-lines hookup. 6. 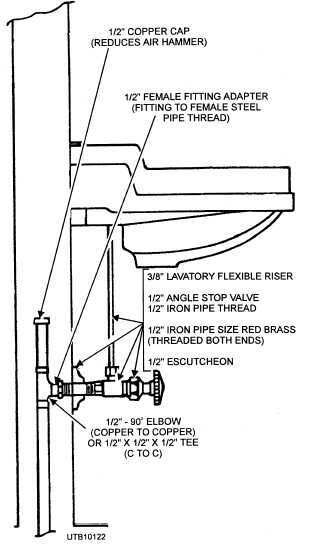 Connect the waste-supply lines, as shown in figure 5-21, to the lavatory. As a Utilitiesman, you may often be called upon to install or make repairs to faucets. There are many types of faucets in general use, such as the bib, lavatory, bath, and kitchen combinations. The hose bib faucet, as shown in view A, figure 5-22, is used where outside hose connections are needed.